Basic and translational groups: Based on the fruitful and outstanding achievements of CMU, we will continue in-depth research on basic biological sciences (including studies in cancer metastasis and cancer stem cells, etc.) and further expand our research results into the area of translational medicine for more medicinal application. 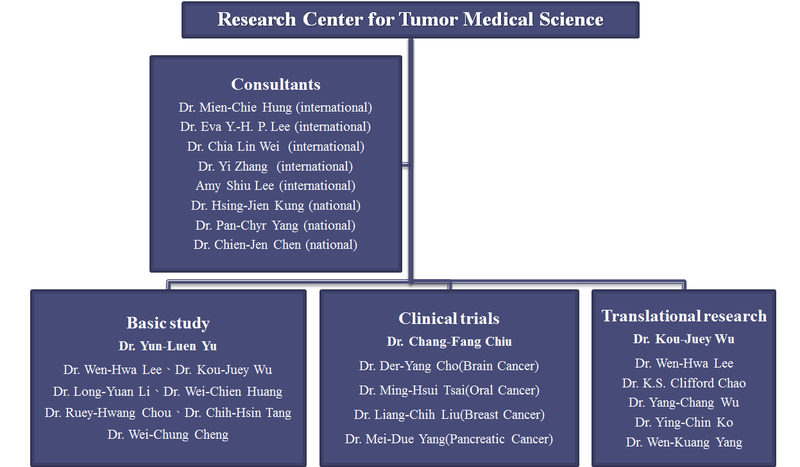 Clinical Trial group: To follow the new-drug regulations and guidelines of the government, our research focuses on three directions, “effective cancer prevention,” “precise early diagnosis,” and “novel targeted therapies.” We will conduct bench-to-bedside studies and promote novel detections and targeted therapies in clinical trials.